This Memorial Day weekend, the nation pauses to recall the sacrifice of its fallen -- one which, 233 years into its history, continues even into the present. About 1,800 military personnel, their families and others attended the Mass. "We gather as an archdiocesan family to place before His throne of grace those who have gone before us in magnificent service to this nation," Archbishop Broglio said. "We also pray for peace and for those in harm's way." The archbishop called on those at the Mass to show others the same love that Jesus shows them. "The true source of love is God. The challenge for us is to remain in the love that Jesus transmits to us," Archbishop Broglio said. Recalling that "Jesus gave up His life for His friends, regardless of their appreciation," the archbishop reminded those at the National Shrine "to love as Jesus loved. To do that, we must first welcome His heart into our hearts." That love, he added, must include the survivors of those who have died in the line of duty as well as those who have been injured or maimed by battle. Archbishop Broglio urged those at the Mass to "pray for them and practice compassion." 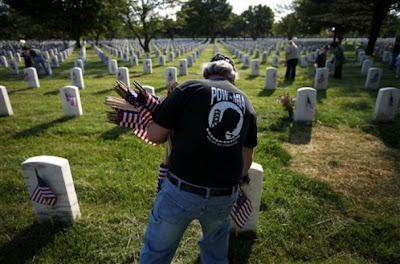 The prelate said Memorial Day offers a "concrete reminder" to pray for the dead, respect life, and care for families of military personnel killed in action, those suffering Post Traumatic Stress Disease and those wounded in battle. Noting that the Church is still celebrating Easter, the archbishop called the "Easter victory" a "gracious gift of our loving Father" that is "a victory over sin and death with the promise of eternal life." Recalling his recent pastoral visit to Iraq, Kuwait and military bases throughout Europe, Archbishop Broglio noted that he is "shepherd of one-quarter of those stationed down range." He said that in meeting with the servicemen and women, he discovered they have the same prayer intentions: the safety of their family, friends, members of their unit and to return home safely. Prior to the Mass, military personnel, their families and others, gathered for a recitation of the rosary, offering prayers for the country, wounded and deceased military members and victims of war. Archbishop Broglio also made a plea for more priests to serve in the Military Archdiocese. He said military priests are needed to "make sure our men and women in uniform have access to the sacraments." Encompassing all US military installations both at home and abroad, the AMS coordinates the pastoral care of the nation's 1.4 million Catholics in uniform.